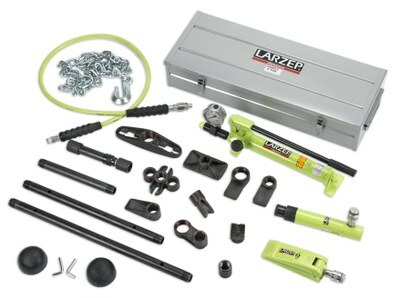 Made of a series of attachments that combined with the pump, cylinder and hose, enable configuration of specific tools designed for various operations such as pushing, separating, joining, lifting, compressing, stretching and fixing. 5, 10 and 20 Tn models available. Supplied in a storage/transport case. The cylinder provides the indicated nominal force, but as some attachments can induce cylinder side loading, the unit can only be used at 50% of its capacity, at a maximum working pressure of 350 bar.